The Riders Rasp is a portable, easy & safe to use rasp designed for the amateur rider and owner. 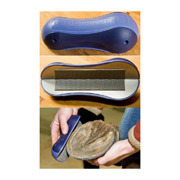 The rider's rasp is ergonomically designed and can be used with either the larger or smaller end in the palm of the horse owners hand depending on hand size and preference (the blades are quickly and easily reversed). 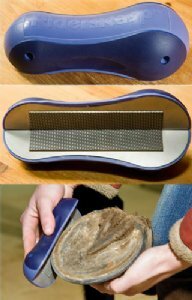 This allows the horses hoof to be held to the side and in one hand, the same as if you were picking the feet out which is safer, more comfortable, and easier than with a traditional rasp. The Riders Rasp has professional quality, long lasting, &replaceable rasp blades.